On Friday, a shiny new pair of Red Dragon Armoury HEMA fencing masks arrived via courier, setting our plans for the weekend at the house. It was great to finally be able to fence without worrying about losing an eye, although it will take a while to relearn not to block the face with the hand when a long pointy thing is thrust towards it. 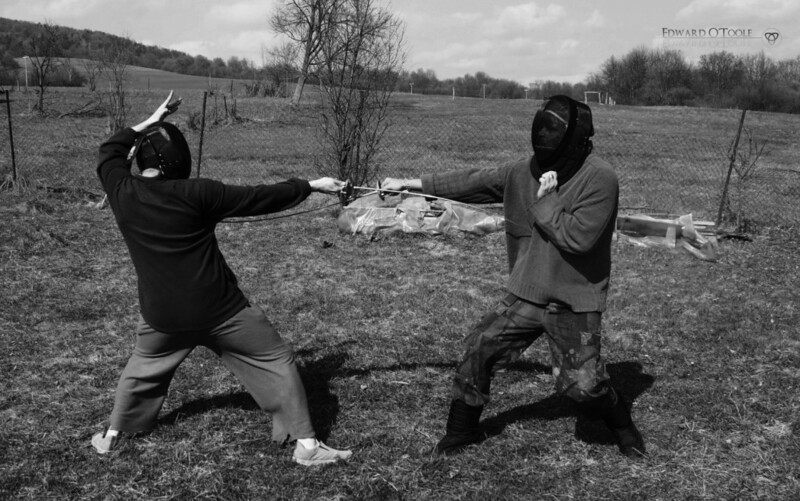 My eldest boy, Brano, is an excellent sparring partner for me because he’s utterly dedicated to learning about historic swordsmanship and the swords themselves. I, on the other hand, like the adrenaline and focus needed to fence, regardless of sword or style. It’s also a much needed form of exercise for my lazy-arsed self. 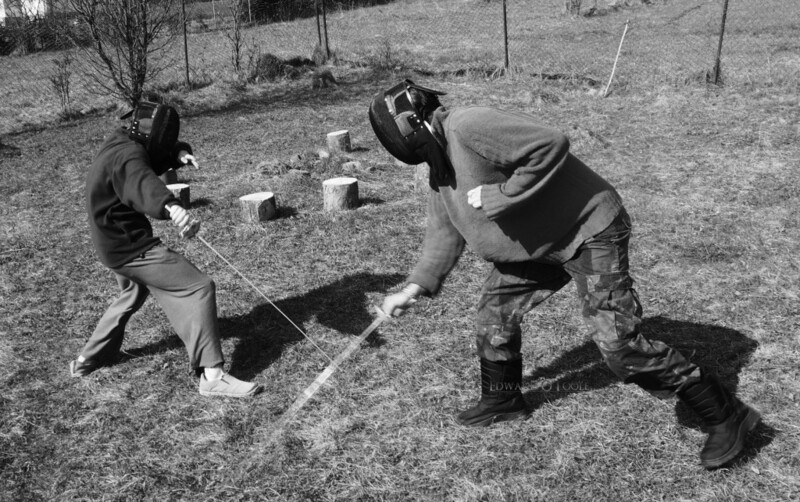 While we are currently using foils, it is unlikely that either of us will do this at club level so our fencing etiquette (and gear) is fairly minimal. 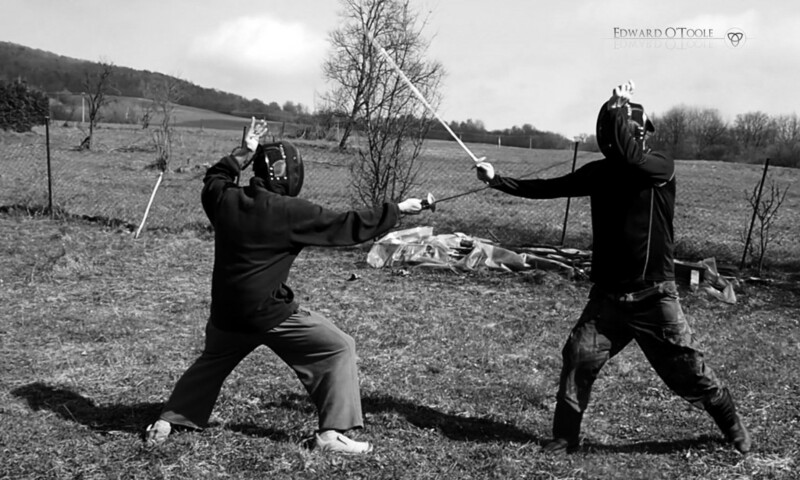 It is more important to become proficient in a wide range of sword styles in a more practical setting, as was originally the purpose of sword practice, rather than the highly streamlined supersport of Olympic fencing. Plus, I don’t think they have a Jack Russel barking and ankle-biting on the Olympic piste. We also have extremely different backgrounds in swordsmanship (although we regularly trained together with bokken while my son was growing up): my go-to texts were Miyamoto Musashi’s Go Rin No Sho, 1645, and Yamamoto Tsunetomo’s Hagakure, 1716, while my sons would be George Silver’s Paradoxes of Defence, 1599, Donald McBane’s The Expert Sword-man’s Companion, 1728, or Angelo’s The School of Fencing, 1787. It is actually through my son that I too have taken an interest in what is currently known as Historic European Martial Arts. The foil is excellent for learning thrusting and micro-movements, as opposed to great sweeping slashes usual in other sword forms. It is also important to learn the etiquette. There are very few modern sports which combine the skill set required for fencing, and due to the limited target area in foil (the chest) it is a means to hone precision with a blade. It’s definitely a buzz. Plus, every gentleman should know how… It’s amazing feeling that connection to days gone by, when our ancestors needed such skills to survive. Photos were taken by my younger boy, Alex.